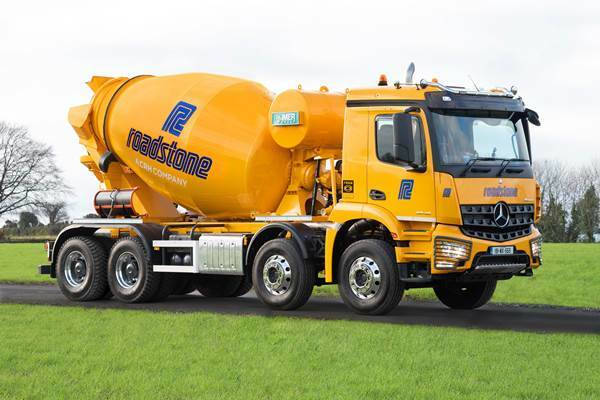 Soon to become a familiar sight on Wexford roads, the new unit will be put through its paces delivering poured concrete mixes on behalf of Roadstone Ltd. and is finished in the company’s distinctive orange livery. Supplied by Camolin-based Mercedes-Benz commercial vehicles dealership Somers Commercials Ltd., the Arocs is fitted with a mixer body from Midland Truck Mixer Parts and features a fully automatic gearbox, air conditioning and cruise control – for enhanced driver comfort. Coupled with its high cab and elevated driving position, designed for all-round visibility and safety, the Arocs has gained a reputation for being a loadable truck that delivers power, robustness and efficiency in equal measure.